In 1991, a group of loyal Catholic education supporters started the Marian Club. 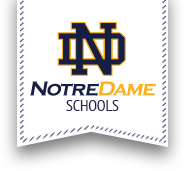 Since then, under their leadership, and with the help of other members, approximately $500,000 in scholarship aid has been given to Notre Dame Students who had financial need. During the 2017-18 school year, $15,000 was awarded by the Marian Club. Located below are membership forms and nomination forms for recognition at the Marian Club Dinner.